I have found documented proof in Harmer's Sale 3006 (lot# 4003) that 1,000 normal perforated forgery sets of this issue have been moved onto the market! I have recently acquired a perforated set of the forgeries. I have now modified this page to make it even easier for you to detect the forgeries. 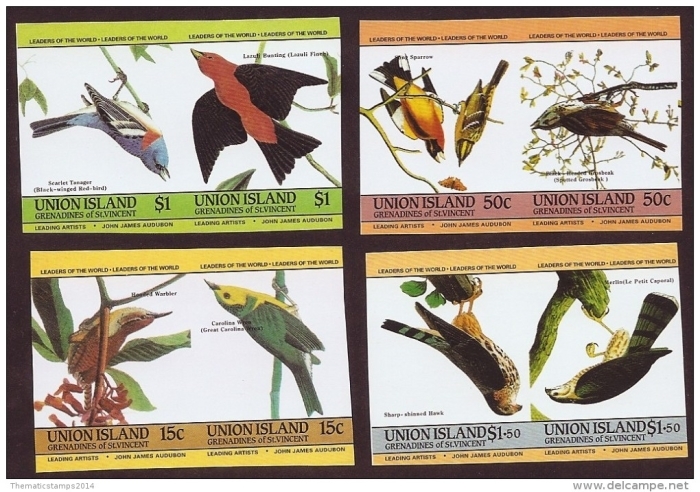 ALL INVERTS OF THE UNION ISLANDS 1985 AUDUBON BIRDS ISSUES ARE FORGERIES. Also noting the seller of these has a ton of other forgeries he was trying to move on Delcampe. Based in Israel showing how widespread the forgeries have become. If he keeps it up we will have him shut down....permanently. I have discovered that modern fake stamps of this issue are being flooded onto the market a long time ago now. Just did not get around to posting this page because of the tons of other forgeries I have been documenting. I can tell you that real dangerous	fakes or some call forgeries are being flooded on the market as I wrote this page in November of 2016. The sets imaged above are all fakes! I note that the Latvian based gang under user names asrm10, armi777 and balticamber2011 (Real names are Raimonds and Antanas Miskinis owners of Argi-Stamps and SIA Stamps) are the culprits who have moved hundreds if not thousands of these forgeries onto the market through eBay. Last recorded sales were January 20, 2018! My research into the printer has enabled me to discover modern fake stamps have been created in 2014!! They are being spread across the world through online auction sites like ebay and Delcampe. Everything about them is fake except for one dangerous fact, they have the correct perf size. The gum type is different in it being white in color and very shiny. This gum type was not used until much later years, long after Format went bankrupt thus proving they were not produced by the Format International Security Printers. Obvious differences will be shown below. 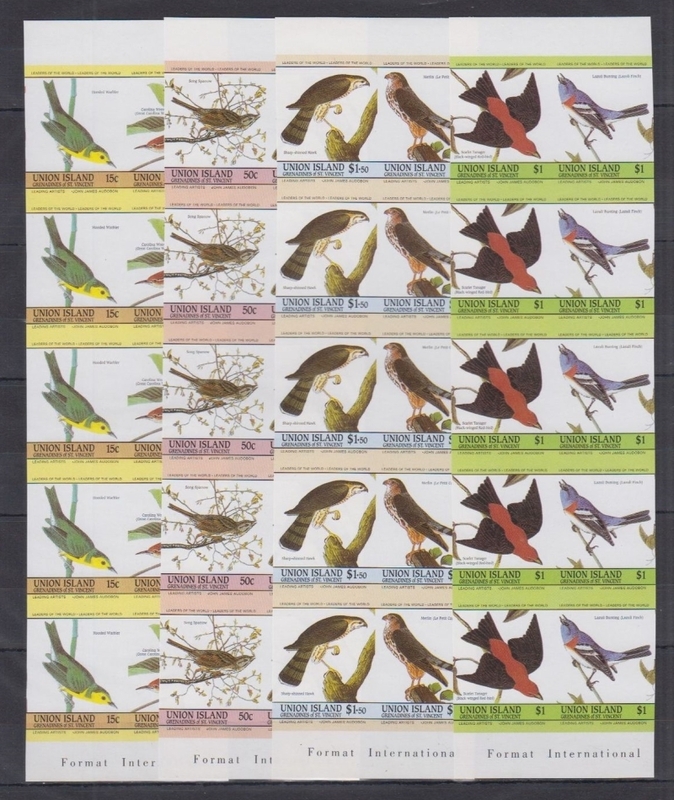 So far I have discovered complete perforated and imperforate sets and inverted frame error forgeries of the Saint Vincent Leaders of the World 1985 Audubon Birds issues. All are being offered online right now as I re-write this on February 17, 2018. 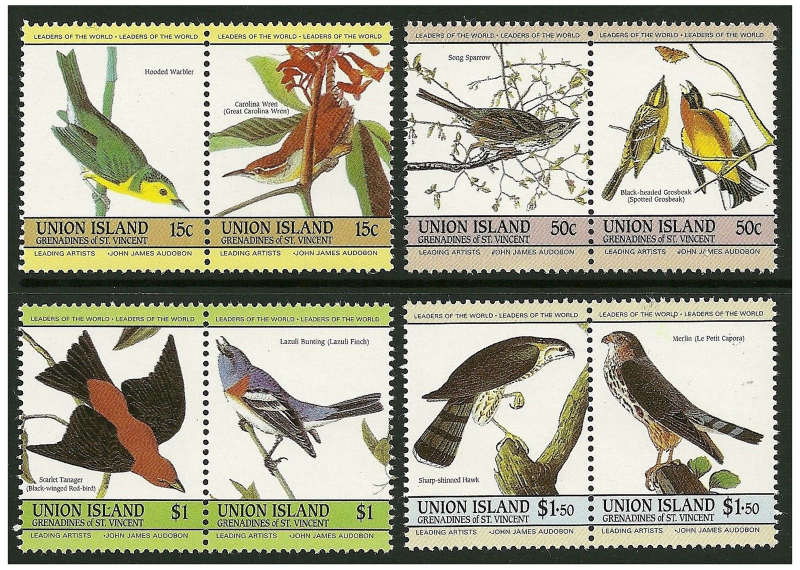 I noticed sales of the Saint Vincent Union Island 1985 Audubon Birds issues as inverts being sold on ebay from a dealer named stampbank_of_london. This dealer has since stopped selling on eBay but continues on Amazon and elsewhere. This dealer is a large volume dealer and was and is offering these forgeries along with every other forgery I have created these pages for. This "company" is one of the worst companies I have ever seen hit the internet offering massive forgeries claiming them to be "later printings" of legitimate issues. 30 year "later printings" are nothing but forgeries....period. This "dealer" also offers massive numbers of illegal stamps and is obviously connected to the source of the forgeries. This "dealer" has infiltrated every auction venue and online retail sales outlet you can imagine. Ebay, Delcampe, Amazon, Alibaba, personal websites. When this dealer first appeared in 2014, (sic) same time the forgeries hit the market, he claimed these forgeries were "genuine" from the "original print run" and "not a reprint". Some of the forgeries he actually "claimed" came from the archive! 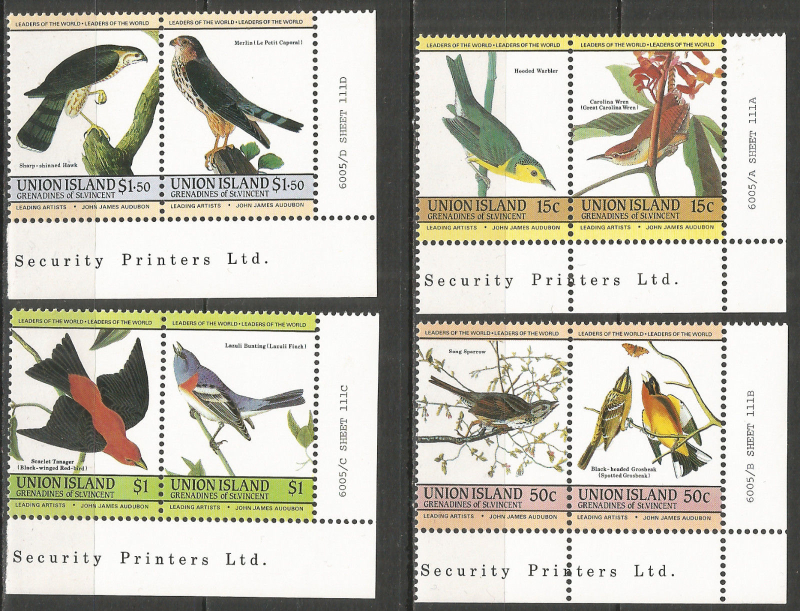 "Quantities of most of these issues perforated, imperforate proofs, errors and intentional errors came onto the market after the liquidation of the Format International Security Printers Ltd. in 1988. There are some varieties that are legitimately rare." I can tell you this.....these are NOT ONE OF THEM and are definitely not rare!! Every "invert" this clown is offering is fake. Most (if not all) "Leaders of the World" stamp issues this clown offers are fakes. If you buy just about anything from this "dealer" you are asking to be ripped off!! Want to sue me?? BRING IT ON! Let's bring your fake crap and I will bring the originals and let's see what a judge and anyone else that wants to join in determines. Guarantee it.....YOU will lose.....clown! I know that they are forgeries because other forgeries I have purchased from this same dealer on ebay and posted the feedback proving I got them there. Guaranteed that this dealer among others is a huge problem in the stamp market and contributes to the demise of the philatelic world. I have alerted the APS, American Philatelic Magazine editors, Scott catalog editors about these forgeries. Other than one editor of the Philatelic Exporter who only wrote the article because of influence by several British based stamp dealers the rest have been tending to ignore it. Now they are everywhere and thanks to your leaders and "experts" you cannot trust what you buy as far as stamps originally printed by the Format International security Printers is concerned. Are you going to ignore it also? 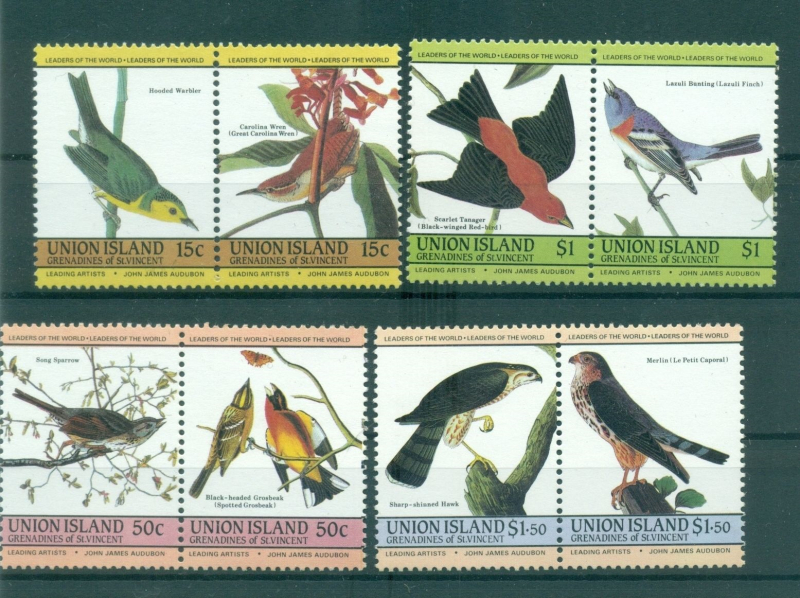 First a little history on the Union Island 1985 Audubon Birds set. Long ago this set was reproduced as "unauthorized reprints" by Clive Feigenbaum in the early 1990's. The perforated version is easy to tell in that all you have to do is count the perforation holes to see if they are genuine or the "reprints". Here is the link to my detailed page on these "reprints". Some of the images on this page were taken from eBay lot offers and all are recorded including snapshots of the lot page and archived. So if anyone wants to argue or deny the fact that they are or were selling the stamps in the images....well you have no defense to deny the fact that you have. On this page I will describe how to tell the difference between the forgeries and genuine stamps which is quite easy from just images given by sellers. On Nov. 24, 2016, when I original published this page I just took the images from all available sellers on eBay for your comparisons. It was and is to show you just how bad the problem has become as far as you getting a genuine set. You now have only a 50% chance of not getting ripped off! I state on the reprint page that almost 50% of the sets offered are now the unauthorized reprints. 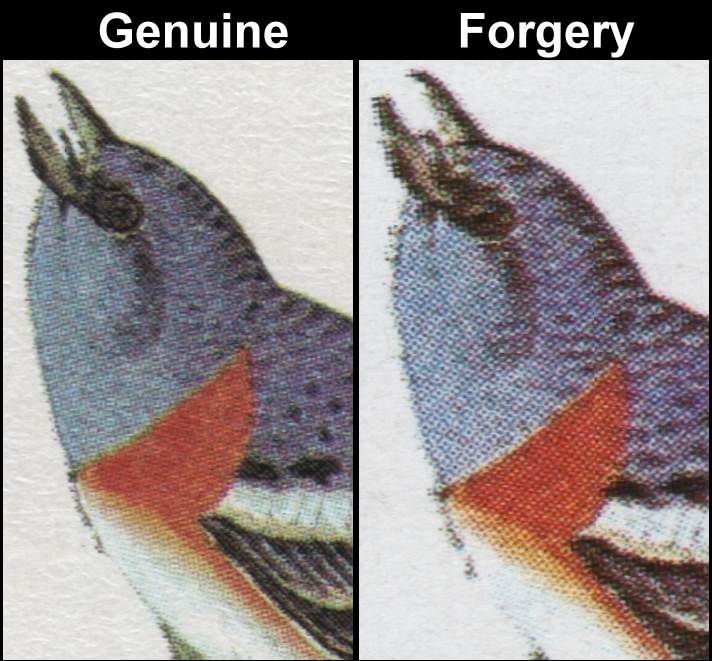 Now you can add the forgeries which in a bit more time will make the factor change to 75% offered on the market being either forgeries or unauthorized reprints. I now have everything together to present to you how to detect the forgeries and not get ripped off!! I note that these images are taken with an iphone. Conditions make the brightness differ with each picture taken so the genuine set "looks" different as far as brightness. the images are to give you a basic idea of what to look for. I have found that all of the forgeries glow brightly. Here is the comparison. You can see there is an extreme difference in color and texture. Again there is an obvious difference in color and texture. I use the $1 values for comparisons. you will see an easy way to detect the dollar values below. 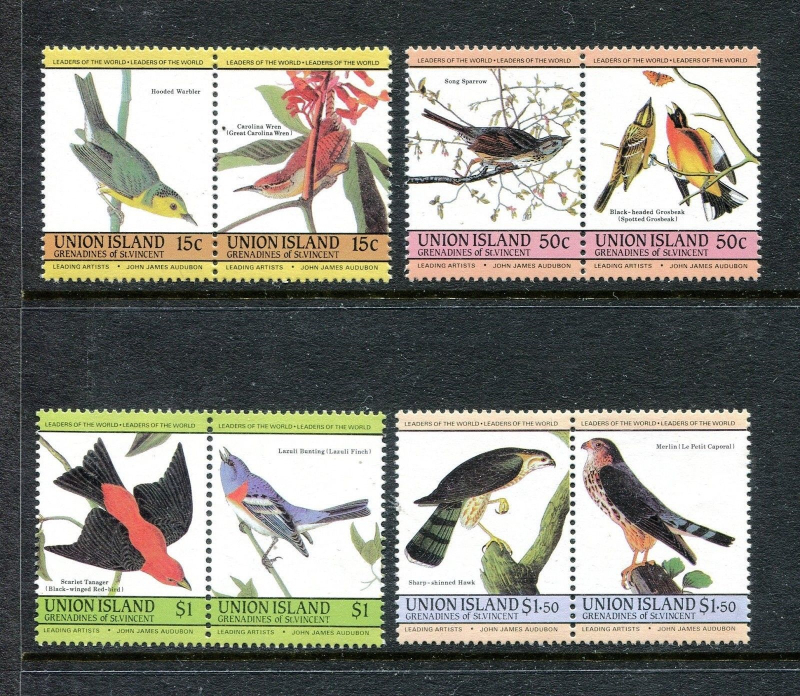 Note the differences in color on the fake stamp. The inferior screen pattern that has lost a major portion of the details. Now let us look at the fonts. It is quite easy I found to define the forgeries from the originals. 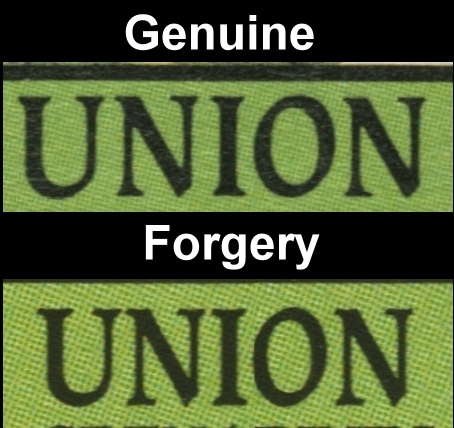 The "I" in "UNION" almost touches the "N" on forgeries (and the reprints I might add). On the originals there is a good spacing between the two letters. Note the difference in background color. In all my studies of these forgeries one thing is clear. 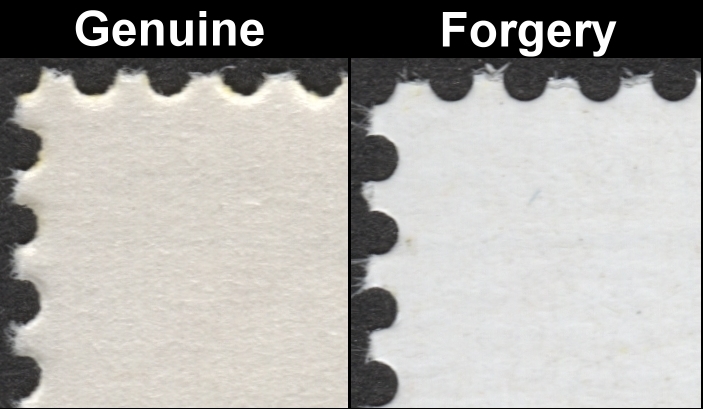 The forgers cannot match the original colors exactly. I have found that the forger made the same mistake on the normal perforated versions of the dollar value pairs as Clive Feigenbaum did on the unauthorized reprints of this issue. 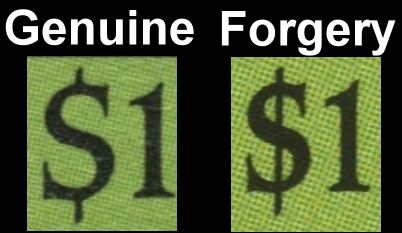 The dollar sign "$" has the vertical bar running all the way through it on the forgeries and the unauthorized reprints, whereas on genuine stamps there is only a "tab" at the top and bottom of the dollar signs. Here I have discovered another thing though. On the inverted frame error forgeries this has been corrected! No bar running through the dollar signs on them. I guess the forger figured since all the inverts are forgeries he did not have to have the bar run through on the dollar signs to (sic) detect them. See the imaged set at the top of this page. The dot between the words at the bottom "Leading Artists" and "John James Audubon". On the normal perforated forgeries it is offset to the right and on some it is even in the same position as the "J"!! Obviously on genuine stamps the dot is well centered between the two sets of words. 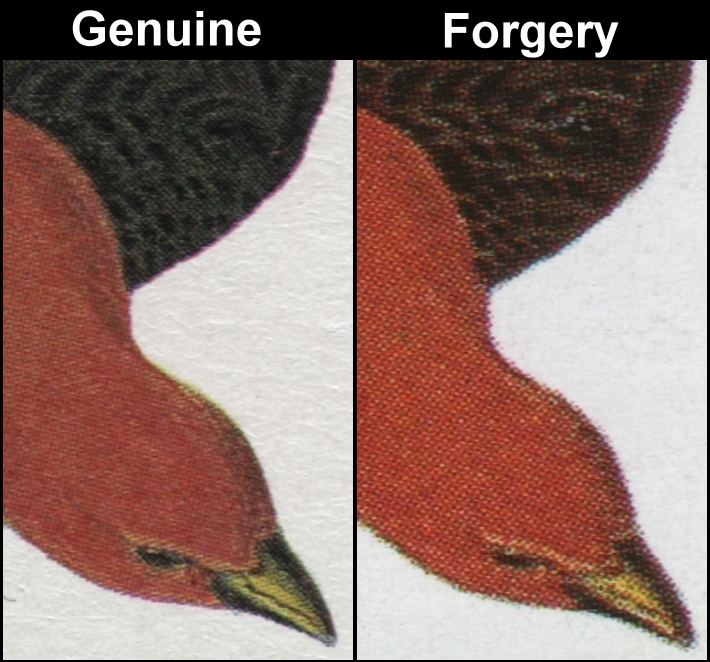 Again this same problem is on the unauthorized reprints made by Clive Feigenbaum in the 1990's showing us a direct connection between those reprints and these newest forgeries. Noting again that on the fake inverts the dot is well centered showing the forger(s) knew this could be detected and corrected it. Again see the image of the inverts at the top of this page. 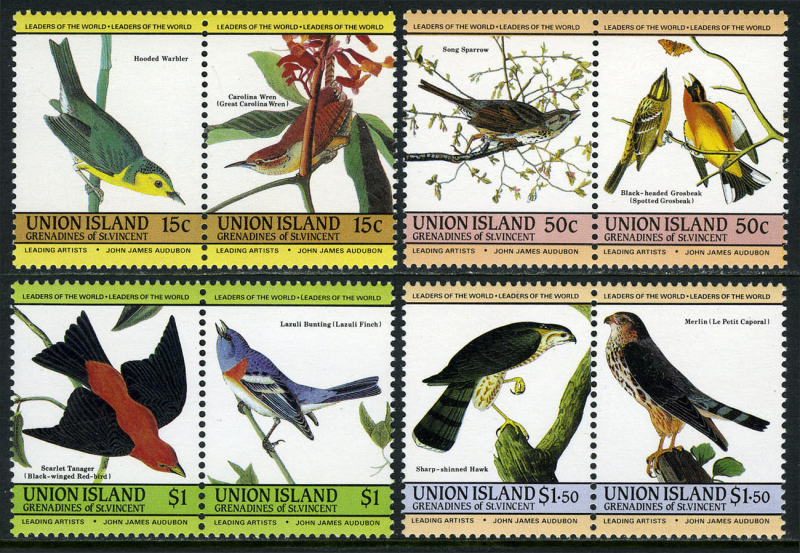 The Hooded Warbler's back is yellow-green on the forgeries, dark green on genuine stamps. 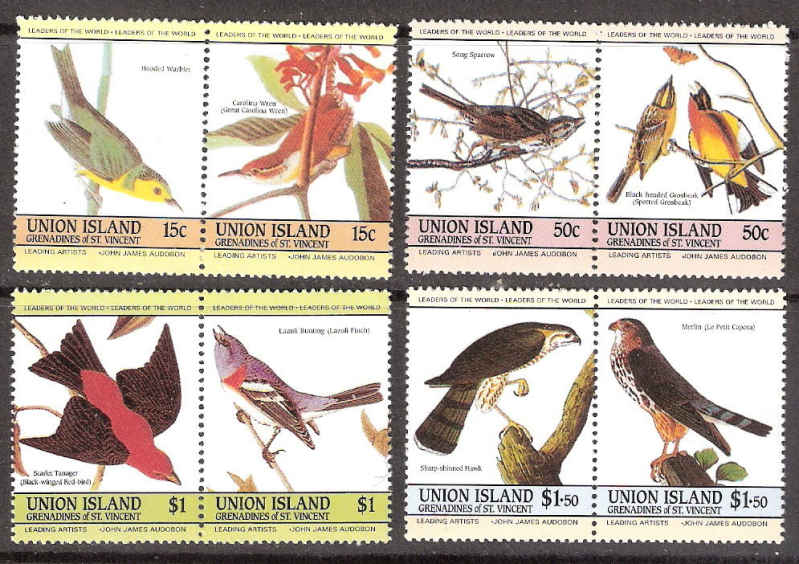 The Carolina Wren's back and the flowers are red on forgeries, Brown-red on genuine stamps. The "c" of the 15c denomination is well spaced away from the "5" on genuine stamps. It is very close to the "5" on the forgeries. 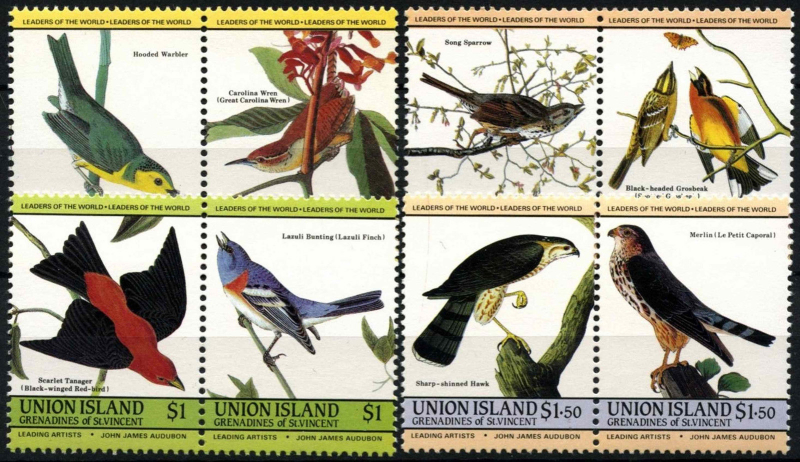 The parentheses "( )" around the words "Great Carolina Wren" are straighter with less curve on genuine stamps. On the forgeries they extend down below the letters whereas on genuine stamps the bottom of the parentheses is "in line" with the bottom of the letters. The country name color bar is light brown on genuine stamps. It is very pale light brown on the forgeries. On the genuine stamps the letters are "St." in the country name. On the forgeries it is "ST."! The dot between the words at the bottom "Leading Artists" and "John James Audubon" is offset to the right on the forgeries. It is centered on genuine stamps. 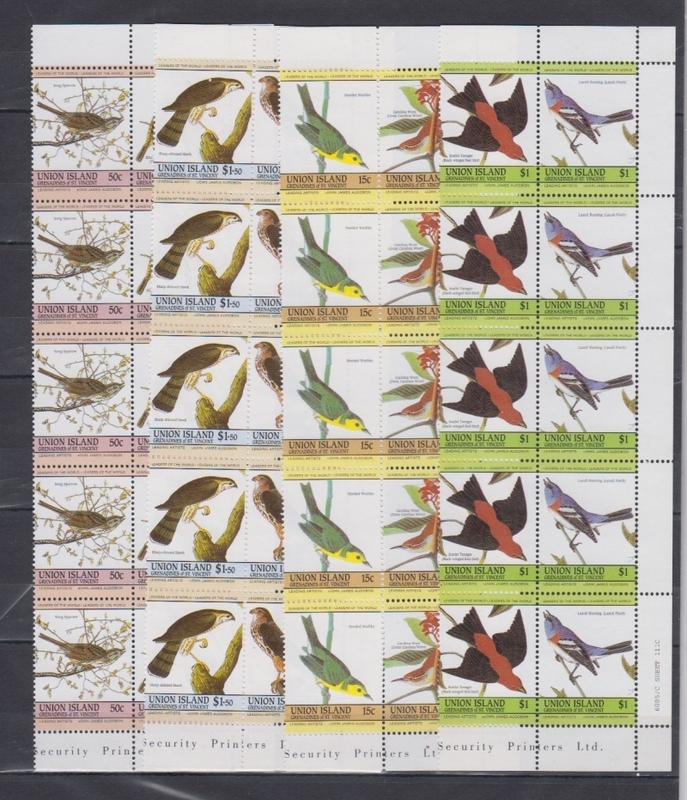 The Song Sparrow's wing is light browns on the forgeries, dark browns on genuine stamps. 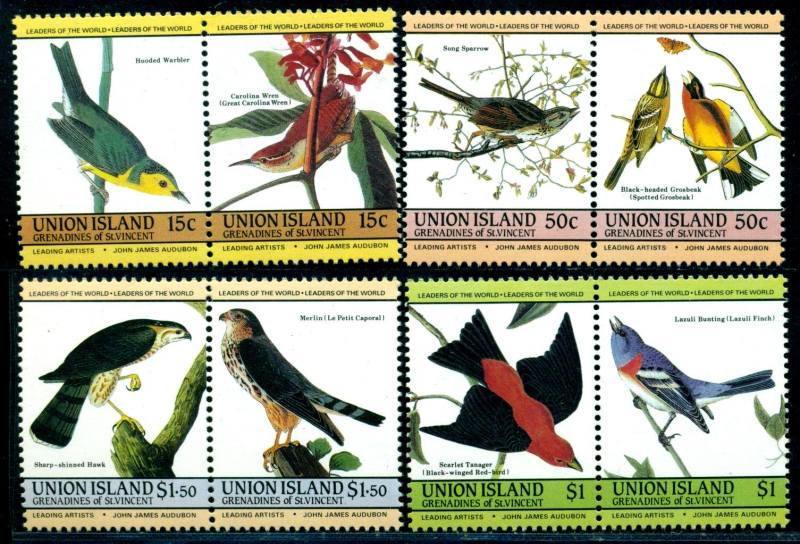 The Stripes on the Spotted Grosbeak's head and the wings are shades of light brown on forgeries, They are shades of dark brown on genuine stamps. The "c" of the 50c denomination is well spaced away from the "0" on genuine stamps. It is very close to the "0" on the forgeries. 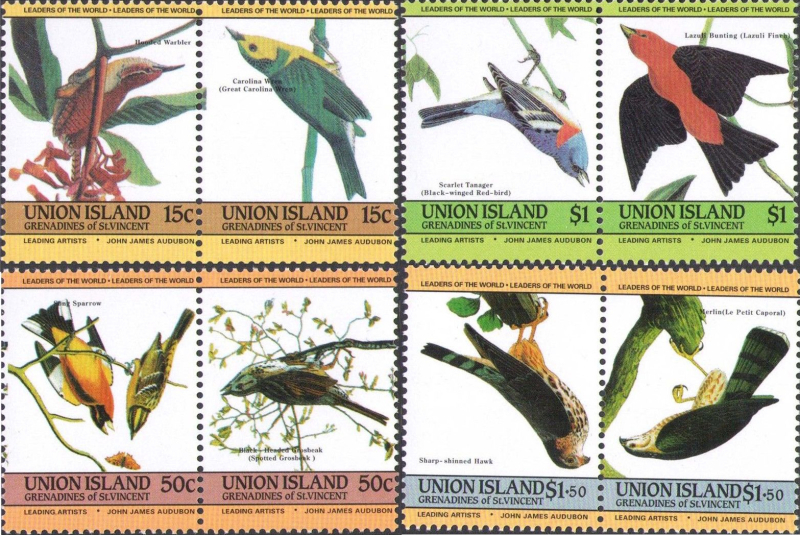 The parentheses "( )" around the words "Spotted Grosbeak" are straighter with less curve on genuine stamps. On the forgeries they extend down below the letters whereas on genuine stamps the bottom of the parentheses is "in line" with the bottom of the letters. The country name color bar is light red on genuine stamps. It is very pale lavender on the forgeries. The dot between the words at the bottom "Leading Artists" and "John James Audubon" is offset to the right on the forgeries. It is centered on genuine stamps. On this forgery it is sitting on the "J"! 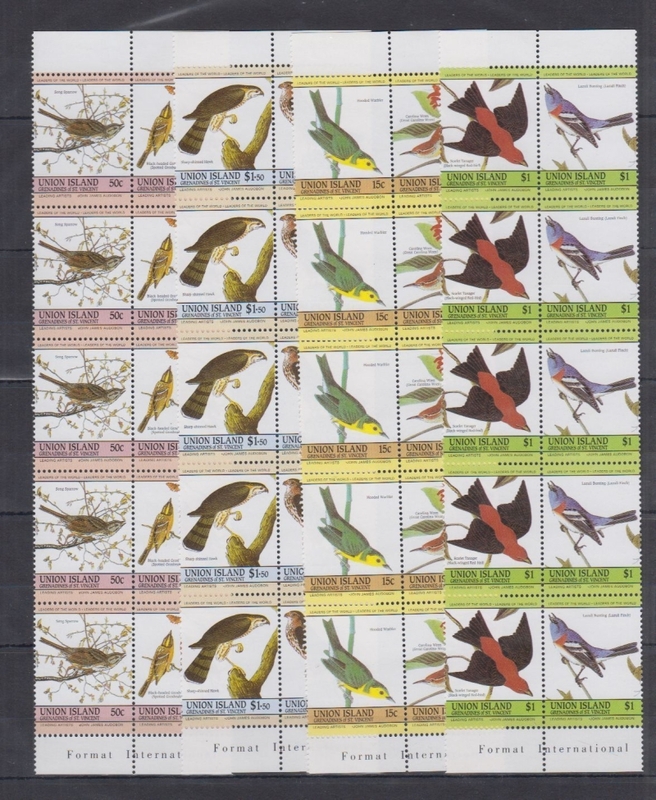 The Scarlet Tanager's wings are dark browns on the forgeries, Almost black on genuine stamps. 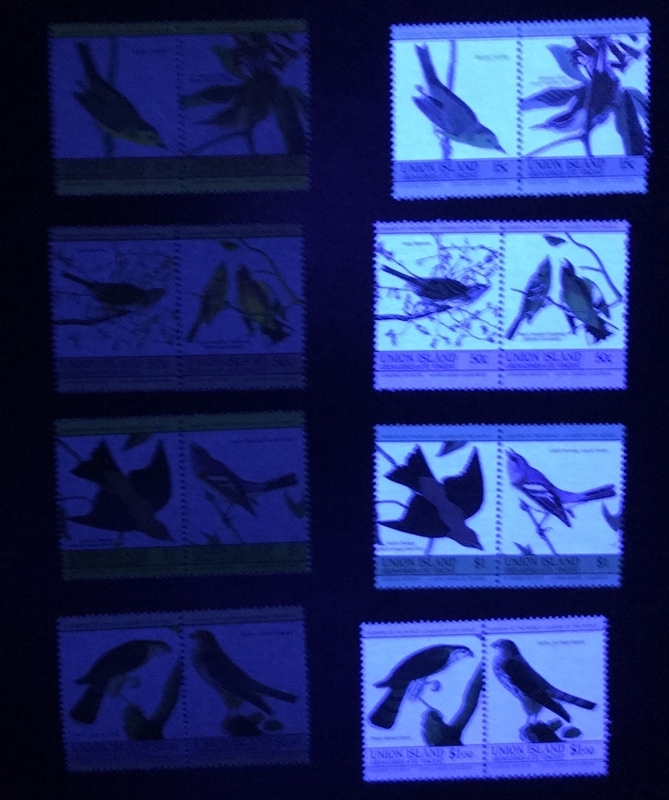 The wings on the Lazuli Bunting are brown and white on forgeries, They are black and white on genuine stamps. The dollar sign "$" has the vertical bar running all the way through it on the forgeries. On genuine stamps there is only a "tab" at the top and bottom of the dollar signs. 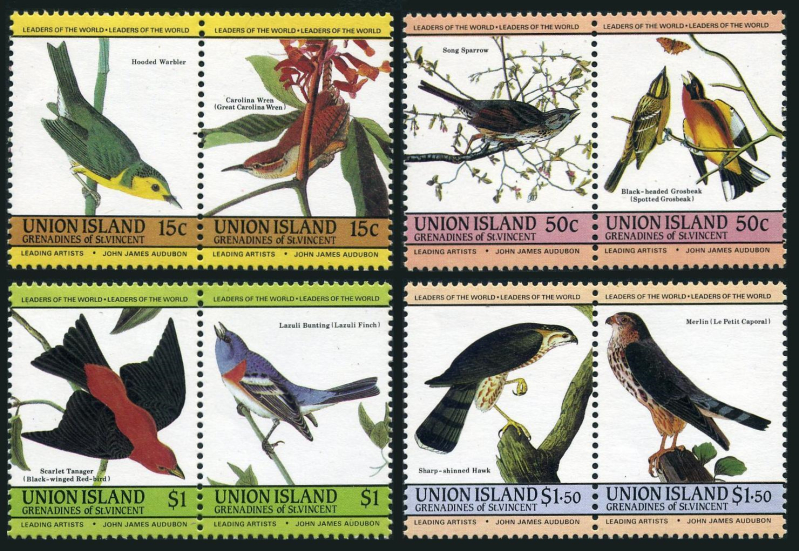 The parentheses "( )" around the words "Black-winged Red-bird" and "Lazuli Finch" are straighter with less curve on genuine stamps. On the forgeries they extend down below the letters whereas on genuine stamps the bottom of the parentheses is "in line" with the bottom of the letters. The country name color bar is light green on genuine stamps. It is light yellow-green on the forgeries. The Sharp-chinned Hawk's wings are dark browns on the forgeries, Almost black on genuine stamps. 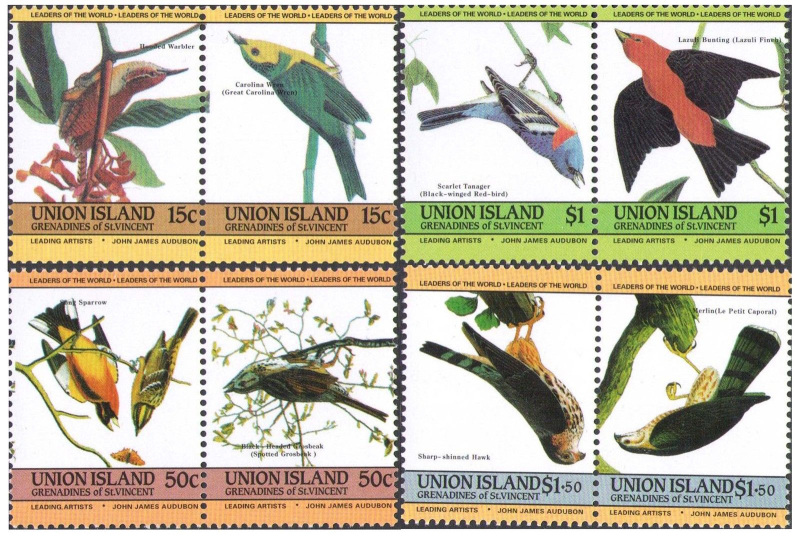 The tree stump the hawk is perched on is green on genuine stamps. It is almost yellow on the forgeries. The wings on the Merlin are shades of dark brown on forgeries, They are shades of black on genuine stamps. The Merlin's back is dark purple on genuine stamps. It is dark gray on the forgeries. The parentheses "( )" around the words "Le Petit Caporal" are straighter with less curve on genuine stamps. On the forgeries they extend down below the letters whereas on genuine stamps the bottom of the parentheses is "in line" with the bottom of the letters. Did you catch this one? The word "Caporal". It is misspelled on the forgery. "Capora". This is difficult without good imaging but the country name color bar is light gray on genuine stamps. It is light blue on the forgeries. You can see that there is a lot of differences between the two printings. 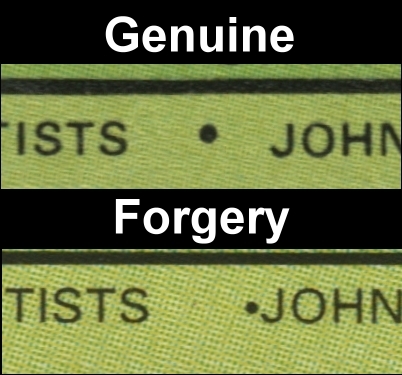 I would rate this set of forgeries as a mighty blunder by the forger! Still unknowing collectors and dealers will be fooled by it. One item that is different on this issue in regards to the forgeries is the selvage. I have found that the forger has placed the perforations running through the selvage on three sides. This makes it different than many of the sets of forgeries I have described on other pages. In most cases we have been able to see that with the forgeries the perforations do not run through the selvage on panes. With this issue it is not the case as this image shows. 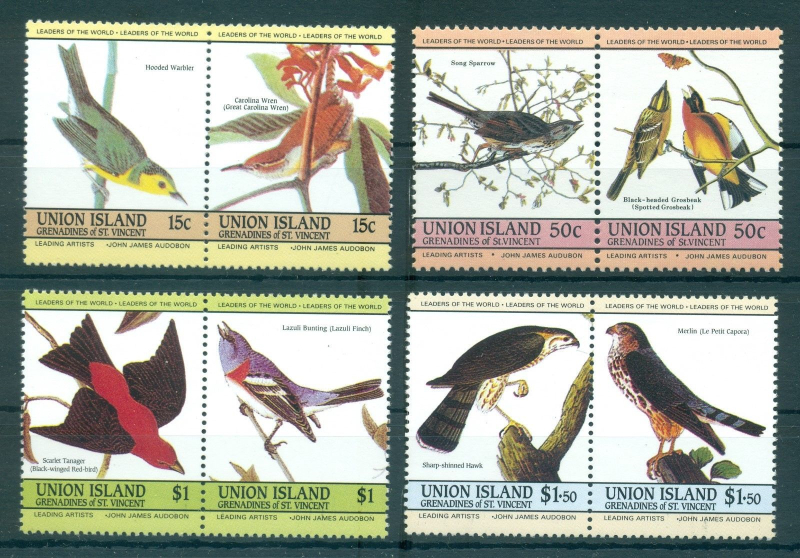 Here I image, describe and name all sellers on eBay selling sets of the Union Island 1985 Audubons Birds issue on November 24, 2016. Some I cannot show because this is only through the U.S. site looking at worldwide sellers who will ship to the U.S.. There are more that I cannot see. Again, just count the perfs. Can you see the genuine stamp pair? Apparently this seller can't! Just count the perfs and look at the placement of the "I". Just count the perfs and look at the placement of the "I". Colors are dulled either by bad scanner or they were exposed to light for extended time. Just look at the placement of the "I", the $ sign the offset dots and count the perfs which match genuine issues. Even though he distorts the image you can detect them. Just look at the placement of the "I". Just remember that no "inverts" of this issue were ever produced by the Format Printers. So you can see that almost 50% of the sets offered on eBay are not genuine! That is just on eBay alone! Indeed several issues that I have researched and obtained the original varieties of are effected. This set does not effect me at all. Only what is imaged here is what I own. I am a professional tradesman and have never depended on stamps to live on. 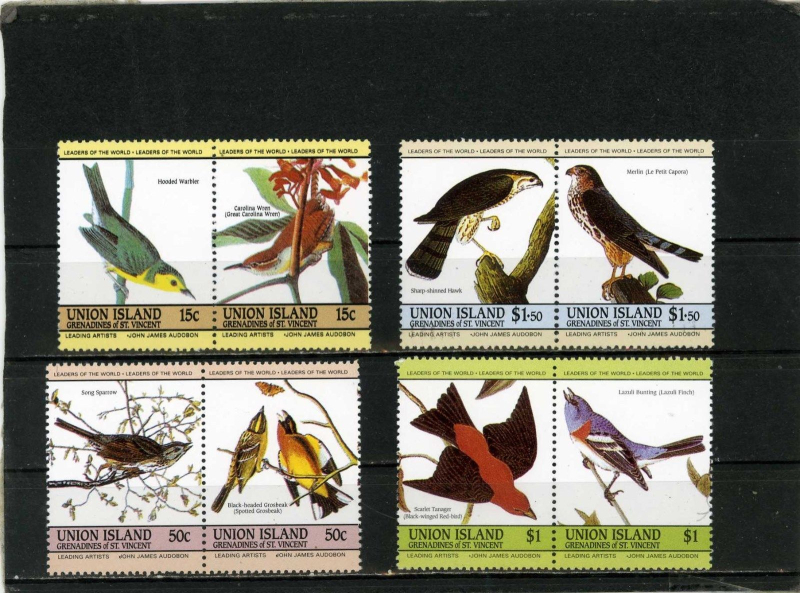 There are many that do depend on stamp sales though and it is for them also that I have created this section of the website. 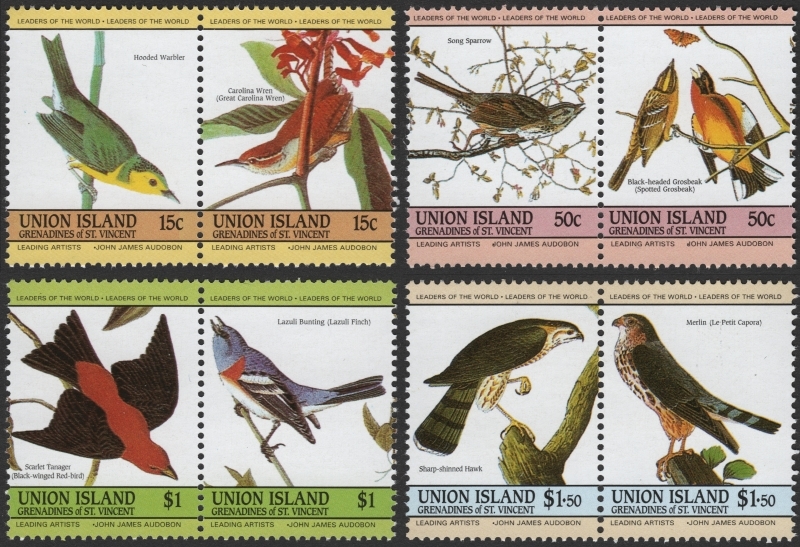 You can now define the Saint Vincent Union Island 1985 Audubon Birds stamp forgeries easily and can now possibly avoid being ripped off! Sorry to say this, a lot of you already have been fooled and more of you will be until the right people get serious about it!